Back to the Future. An even further mutating Hank McCoy is dying. His solution, time travel back to the past and bring back the original X-Men to help him figure it out and take out Cyclops at the same time. This is pretty crazy plot, even for an X-book. I actually like it. I like it a lot. 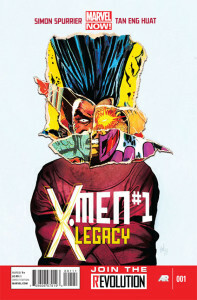 You’re brining a Jean Grey into world where Jean is dead, an Angel into a world where he is Archangel, a human Beast into a world where he is a giant blue hairball that is terminally ill and the Coup de grâce, you have captain goodie-two-shoes Cyclops in a world where he is the X-Men’s #1 nemesis. All of this raises fun interpersonal issues for different characters as well as Wolverine, who is taken aback by the reappearance of Jean. The interpersonal dynamics of bringing the original team to the present is a difficult task to make work. Bendis is up to the challenge. This book is well written. The plot is fantastic, the action purposeful and the dialogue meaningful. 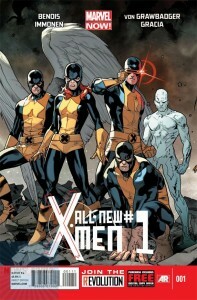 This X-Men is a far more refined product then what I left over ten years ago. I can think of at least a 100 other X-Men characters, villains and/or heroes, to give their own monthly title to, other than Legion. What in the sam hell are they thinking? Why do we care about Legion? I picked up X-Men Legacy #1 to try and find out. What can I say? The story is a little hard to follow at best. We find legion in some kind of Buddhist monk refugee camp, being mentored by a monk teacher. The other half of the story is about mutant prisoners being tortured or experimented on. We come to find out that Legion himself is doing the torturing/experimenting on the inmates. A prison riot co-incides with an attack on the refugee camp and the story gets harder to follow. Realities are bending and its hard to figure out which reality is the true one. The story itself is implying that maybe Legion’s brain is a prison for other mutants and his mind is keeping them captive. It’s hard to say where they are going with the story and I find it hard to have a vested interest in Legion as a character. Alongside shoddy art, this title is ripe for cancellation. I don’t see how there can be any interest for this title. My LCS has already started to drop quantities next to nothing for the third issue. Until Next Time… As enjoyable as All New X-Men is, I don’t know how long they can sustain my interest. Will Cyclops be a villain for long? I doubt it. How long can you keep up the original X-Men in the present? Not long. Will Hank die? Maybe. Would he stay dead for long? Doubt it. Nonetheless I’m in the thick of it for now. All New X-Men is worth your time.